In honor of the Holiday Season, the NAMA Office will be closed on December 23 and will reopen on January 2. We hope you have a safe and happy holiday season and we’ll see you next year! If you entered the Best of NAMA competition, you’re probably getting curious as to whether you won something or not. Regional and chapter banquets have been set for January, just visit the NAMA Calendar for a listing. There are two regions that, while they are not having a banquet will still be sending out plaques to the winners. If you entered through Region 6 (Chesapeake, Eastern & Ohio Chapters) or Regon 1 (NAMA Pacific, NAMA Cal, Desert Southwest & Central California NAMA Chapters) you can expect to receive your plaques and winners lists in late January. All winners of regional awards will be notified February 1 via e-mail regarding advancement to the national judging in February. National winners will be announced at the National Best of NAMA Awards Ceremony, which will kick-off the 2005 Agri-Marketing Conference and Trade Show, April 19-21 in Kansas City. For more information and registration information on the Best of NAMA Regional/Chapter Banquets visit the NAMA Calendar. NAMA is proud to announce 4 new additions to the Advocate Program. The goal of the new advocates is to help recruit new members and advocate for the organization. Special thanks to new advocates, Lori Strum, Strategic America; Stephanie Vinton, Agri-Access; Lee Dueringer, Arizona 4-H Youth Foundation; and Sally Behringer, DTN. If you are interested in becoming an advocate, you will receive membership materials from the NAMA office to help you get started. In addition, you will get the satisfaction of helping the organization and you’ll be recognized in the NAMA News section of Agri Marketing magazine, NAMA e-news and Grassroots newsletter. You’ll also be recognized at the Agribusiness Forum and the Agri-Marketing Conference with a ribbon on your name badge, and will be invited to the "First Timer/Leader" reception at the conference. As you’ve just noticed, the National NAMA e-News has been given a makeover. We hope that you will find this version more beneficial and user friendly. 1. All articles were listed in your e-mail version, however, you can also choose various articles from the “index” list on the left side of this page under the “e-News Dec 2 ’05” section. 2. The standard articles, such as the Job Postings, NAMA Calendar, and Student Network are also available on the left side of this page under the “reference” section. 3. Want to view a job posting? It’s simple, just login using the same password you use to access the membership directory and postings on the NAMA Web site. If you don’t remember the password, just e-mail Linda Schaefer at lindas@nama.org. 4. If you are looking for a certain article or for certain information, you can use the “Search” feature to locate what you are looking for. 5. If you want to look at issues from previous months, the e-News will be archived so you can take a look at past issues. 6. You will also be able to add comments to articles or even update your chapter events on the NAMA Calendar. We want to hear your opinions on this new look, please add any feedback you may have on the new e-News by clicking on the “comments” button below! Southeast NAMA Membership Chair, Lee McCoy (Southeast AgNet), was diagnosed with cancer of the esophagus recently. Lee, a NAMA member since 1982, says the cancer was caught early so the outcome is optimistic. He will have more information on the treatment and outcome over the next few weeks as more test results come in. Please keep Lee in your thoughts and prayers during this difficult time. If you would like to send words of encouragement to Lee, please post your comments below or contact him at (678) 423-1097 or via e-mail at lee@southeastagnet.com. 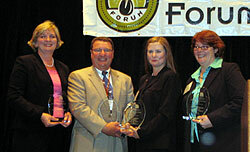 Nearly 200 attendees participated in the 2005 Agribusiness Forum that was held November 8-9 in Kansas City. This year’s Forum took place just prior to the NAFB Convention and featured industry experts from inside and outside the agricultural community. Individual speakers and panels explored marketing, and the dramatic changes in the rules of business interaction throughout the agricultural value chain. "This is one of the better groups of speakers I’ve seen in a while," said John Seatvet, High Plains Journal. Kicking off this year’s Forum was the first annual ABEF Putt Putt Golf Tournament on November 8 which raised over $4,600 for ABEF. The Golf Event consisted of 9 holes of miniature golf and all proceeds from the tournament will benefit the Agri-Business Educational Foundation (ABEF) in support of the NAMA Student Careers Program. 1st Place Team: "Patty’s Putters " which included, Sarah Muirhead, Feedstuffs; Steve Goertz, DTN; Patty Travis, 5MetaCom; and Sally Behringer. 2nd Place Team: "Earthly Beef" included Monte Reese, Cattlemen’s Beef Promotion and Research Board; Chuck Zimmerman, Agwired.com (ZimmComm); Steve Taylor, Missouri Beef Industry Council; and Judi Lampe, Mother Earth News. 3rd Place Team: included Rhonda Ludwig, Farm Progress Companies; Kim Lang, DTN; Lou Ireland, Pioneer Hi-Bred Intl., Inc.; and Vicki Henrickson, Progressive Agriculture Foundation. Hole-in-One: Monte Reese, Cattlemen’s Beef Promotion and Research Board. After the Golf Tournament, the Professional Development Awards of Excellence were presented at a banquet and honored four NAMA members’ achievement in each of the Professional Development Areas. Recipients of the Awards of Excellence included: Bev Larson, NK Brand/Syngenta Seeds, receiving honors in the area of Marketing Communications; Dennis Gehler, CROPLAN GENETICS/Land O’Lakes, who received honors in the Product/Species Management area; Janice Person, Delta and Pine Land Company, receiving honors in the Public Relations area; and Margaret Wallace Oldham, Beck Ag Com, Inc., receiving honors in the Sales area. Special thanks to all of our ABEF Putt Putt Golf and Agribusiness Forum Sponsors and the Agribusiness Forum Committee, without whom the Forum would not have been possible. For a complete list of the sponsors and the committee visit, http://www.nama.org/forum. 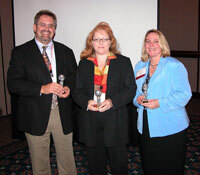 Select “speaker slides and audio” from the Agribusiness Forum are available at http://www.namablog.org/?page_id=70. There is no cost to registered attendees of the forum to access the audio and handouts. If you attended the Forum and have lost the password to access the speaker information, contact Linda Schaefer at the NAMA office at lindas@nama.org. Around 35 members of the North Central NAMA Chapter met for lunch on November 17 to polish up their presentation skills, a topic of high interest to chapter members. Chapter programming chair, Jill Wenzel with the AdCulture Group, scrambled to get more chairs and order more lunches to accommodate the larger-than-expected crowd. The next meeting of the North Central NAMA Chapter will be a Texas Hold ‘Em Poker Tournament on December 15th at the Padilla Speer Beardsley offices in downtown Minneapolis. The $30 entry fee to the tournament will be donated by the chapter to the Minnesota Ag in the Classroom project. High fuel costs and low commodity prices have all of us in agriculture thinking. Our bottom line, whether as a producer, supplier, or service provider is impacted by these very issues. On Wednesday, November 16, the Cornbelt NAMA chapter hosted a panel discussion on the benefits, drawbacks and potential of ethanol and biodiesel fuels. The event took place at Linn Co-op Oil in Marion, Iowa. The audience ranged from those producing the commodities to those supplying the producer with services and products to those utilizing the end product. The interactive panel discussion was moderated by Rich Balvanz with Ag Management Services. John Airy and John Heisdorffer provided not only a local producers perspective but a state and national perspective based on their involvement with the Corn and Soybean Associations. Hawkeye Renewables was represented by Bruce Rastetter, CEO, who has an operating ethanol plant in Iowa Falls and will soon have a new plant in Fairbanks, IA. The Petroleum Manager for the Linn Co-op, John Airy, shared the perspective of the supplier of the end product. The co-op, celebrating its 75th year has recently installed an E85 fuel pump. E85 is a blend of 85% ethanol and 15% gasoline. The price is under that of the traditional gallon of gas or gas blend and can be burned by vehicles that are equipped to run on any ethanol blend up to 85%. These vehicles are referred to as Flexible Fuel Vehicles and are offered by all the major car manufacturers. The limit to this fuel is its availability. Very few stations supply this product making it difficult for the average consumer to take advantage of its benefits. How does the relationship between renewable fuel plants and producers work? Ethanol/biodiesel plants located in Iowa have a sure supply of inputs to make their product from. Producers, many of whom have invested in ethanol plants, have a source to sell their commodity to. Having an additional avenue to sell product impacts commodity prices favorably for all producers as the technology is accepted and expected by consumers as a fuel. The feed by-product remaining after the ethanol has been processed is sold to livestock producers located near the plant. Technology and the resources available in Iowa provide the perfect marriage for production of renewable fuels and commodity supply. Is the marriage made in heaven? Who knows? But as consumers demand cheaper fuel alternatives and producers lobby to make fuel blends like E85 more available it could be another feather in sustainable agriculture’s cap. Gateway NAMA had a tremendous turnout of nearly 60 people at their chapter meeting on November 15. And no wonder — renewable fuels is certainly a hot topic for the ag industry today. Attendees had the opportunity to hear an updates from David Sparks, regional manager for CoBank; John Kleiboeker, director of field services for the American Soybean Association; and Chris Standlee, executive vice president of Abengoa Bioenergy Corporation. Mr. Sparks provided an overview of the risks and considerations involved in financing a biofuels production facilty. Mr Kleiboeker focused on the role of biodiesel and expansion efforts taking place here in Missouri, and Mr. Standlee discussed the growth of ethanol production and how Abengoa’s research & development efforts were helping to expand this. Special thanks to our sponsors for the meeting — the National Biodiesel Board and the Ethanol Promotion and Information Council. If you would like additional information on this topic or on any of the speakers, please contact us at gatewaynama@yahoo.com. The next Gateway luncheon meeting is set for January 10, 2006.